Certain Indianapolis North residents lie in a flood plain, including citizens in Broad Ripple, Warfleigh, South Warfleigh, North Butler-Tarkington and Rocky Ripple. The Indianapolis North Flood Damage Reduction Project (“Project”) confers extensive benefits and seeks to provide protection for some, but not all, flood plain residents (see note 1, below). Namely, the Project currently excludes Rocky Ripple largely because of the availability of funding and the costs of Rocky Ripple flood protection. That is, while the Project provides flood protection to “upstream residents” excluding Rocky Ripple at a cost of approximately $8,000 per structure protected, expanding the Project to include Rocky Ripple would come at a cost of approximately $100,000 per Rocky Ripple structure protected (roughly $30,000,000 in additional costs). These Rocky Ripple costs relative to structures protected preclude federal participation and funding for a Rocky Ripple project extension, and the City does not now have available the required funds. 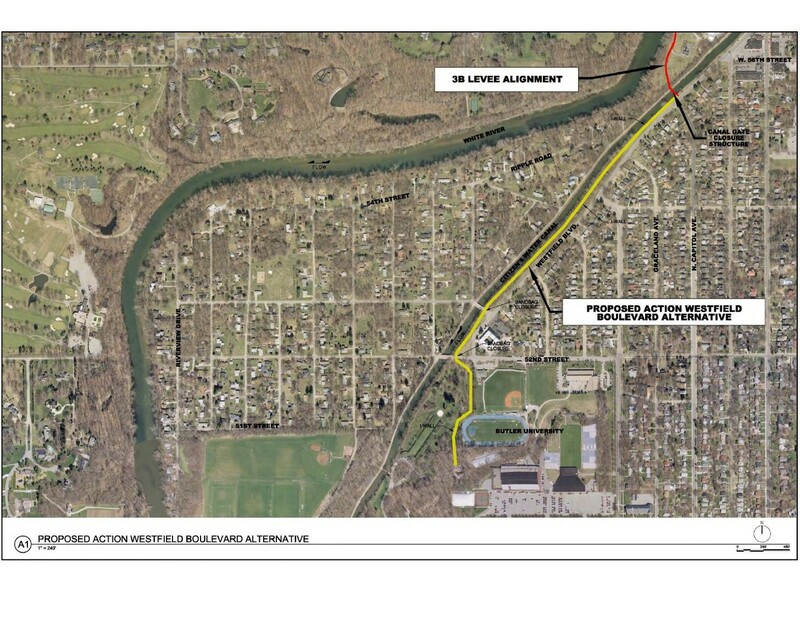 Accordingly, the City works to act now to protect those it can now, completing the current phase of the Project using the “Westfield Boulevard Alternative,” while continuing to explore options to protect others (Rocky Ripple) at a later date (see notes 2 and 3). Various individuals and organizations propose creating “special flood plain tax districts” as a solution to this and similar problems. These individuals and organizations include Indiana Representative Ed DeLaney (D-86), who recently introduced legislation to accomplish such, HB 1549 (see note 4), and the “Build the Wall for All” organization (see note 5). Under these proposals, special tax districts would be created which could borrow the funds needed to cover flood plain project costs by issuing a bond, and the bond would be repaid by an assessment on all properties benefiting from the flood wall. Imposing costs and assessments based on benefit received sometimes is referred to as the principal of cost causation. Unfortunately, special tax district proposals do not work in the case of Rocky Ripple – again, largely because of the cost of Rocky Ripple flood protection. The cost of the current phase of the Project which protects approximately 2,500 homes/structures in Broad Ripple, Warfleigh, South Warfleigh and North Butler-Tarkington is approximately $20,000,000 (with the federal government picking up a share). That’s about $8,000 per home. The cost of the Project would rise by approximately $30,000,000 to a total of $50,000,000 if Rocky Ripple were included in the Project. In other words, expanding the Project to provide Rocky Ripple flood protection comes at a cost of approximately $100,000 per Rocky Ripple structure ($30,000,000 in additional costs divided by the approximately 300 additional structures protected). If you assign costs according to the principle of cost causation upon which the creation of special tax districts rests, then you would create a special tax district that approximately assigns $100,000 per structure to each Rocky Ripple structure, and $8,000 per structure to each upstream structure. That would collect the required $50,000,000 in Project costs ($50,000,000 = $100,000 x 300 homes + $8000 x 2,500 homes = $30,000,000 + $20,000,000 = $50,000,000). AND SO … a better approach for funding Rocky Ripple flood protection, which doesn’t impose a $100,000 surcharge on each Rocky Ripple structure, would be to develop a funding stream for future Rocky Ripple projects that assigns costs over as large a base as possible. The benefit of this approach is that it: (a) would provide funding for future Rocky Ripple projects, (b) doesn’t create an arbitrary and indefensible line of demarcation between those who do and don’t benefit from flood plain projects, and (c) minimizes assessment per structure. Neither Representative DeLaney’s HB1549 special tax district proposal nor the Build A Wall for All proposal achieves this goal. Other pending legislation, for example, HB1440 (see note 6) in part achieves this goal by developing a Rocky Ripple funding stream that relies on Lottery and other revenues – though the assessment still fails to be as broadly based as it could be. (2) For detailed Project history and information see: http://finishthefloodwall.org . For Westfield Boulevard Alternative diagram see: https://savewarfleigh.files.wordpress.co… . (3) Those interested in the City’s continuing attempts to develop viable Rocky Ripple flood protection alternatives should see the City’s recent report (December 2016) exploring alternatives and options: https://savewarfleigh.files.wordpress.co…… . (5) Build the Wall for All: http://www.buildthewallforall.org/ . Interestingly, the leadership of the Build the Wall for All organization that now advocates for Project delay to provide Rocky Ripple flood protection previously advocated for Project delay to study the “West Bank Alignment” which would not have provided any Rocky Ripple flood protection.